In small bowl, mix all Maple-Dijon Dressing ingredients with wire whisk. Cut salmon crosswise into 4 pieces. 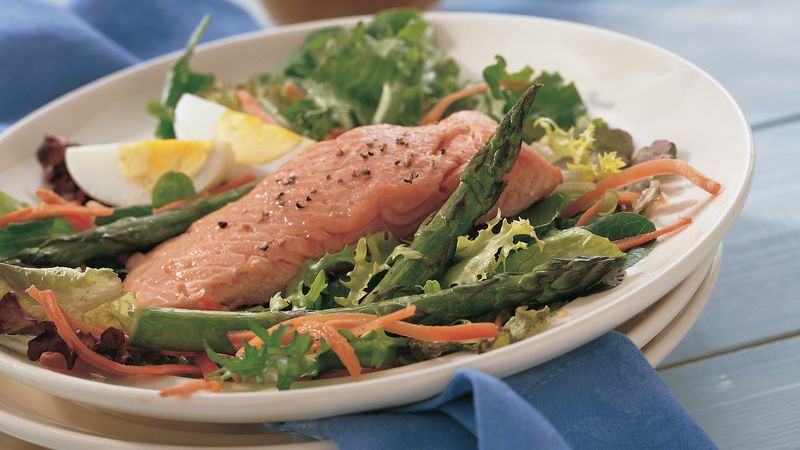 Brush salmon with 1 tablespoon of the dressing. In large bowl, toss asparagus and 1 tablespoon of the dressing. Place asparagus in grill basket (grill “wok”). When grill is heated, place asparagus and salmon, skin side down, on gas grill over medium heat or on charcoal grill over medium coals; cover grill. Cook asparagus 7 to 10 minutes and salmon 10 to 15 minutes, shaking grill basket or turning asparagus occasionally, until asparagus is crisp-tender and salmon flakes easily with fork. Slide pancake turner between salmon and skin to remove each piece from skin. On 4 plates, divide salad greens, carrots and eggs. Top with salmon and asparagus. Sprinkle with pepper. Serve with remaining dressing. Use preshredded carrots found in the produce section of your supermarket. Crusty whole grain rolls pair nicely with salad.